The group navigates New York City’s unpredictable subway line in their latest visual. In Thirdstory's new video for "G Train," the lead single from their upcoming debut LP, the three members of the group trade stories about lovesickness as they ride the subway through New York City's boroughs. The song is a perfect soundtrack for the type of deep contemplation that only happens on the train, when you have altogether too much time with your own thoughts. To conclude the track, Thirdstory recruited Pusha T for a verse about the passage of time and love lost. 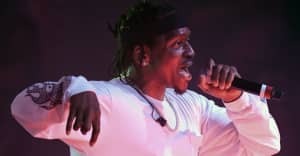 "Our first meeting was out of the blue - we were recording with Malay at Germano Studios in downtown Manhattan and Pusha T happened to be in the next room with Designer," Thirdstory's Ben Lusher told The FADER about how the collaboration came together. "He ended up coming in and listening to a couple songs we had just finished, including G Train. It was hard to tell then if he was into it, he was kinda just bobbing his head and looking at each of us really intently, but later when we decided to add a verse to it we found out he was interested. That was huge for us - it definitely feels good being recognized by a major artist and hip-hop legend like Pusha T."
Watch Thirdstory's "G Train" video, featuring Pusha T, above.